PONDERING IS A DUBLIN-BASED PRODUCTION COMPANY, MAKING FILM AND WEB CONTENT WITH A SPECIAL FOCUS ON COMEDY. WE VALUE WORK WITH AN OFF-BEAT VOICE, A STRONG SOCIAL MESSAGE AND A FOCUS ON THE AUDIENCE. Pondering was founded by actor and producer Karen Healy in 2014, expanding the with the addition of writer-director Michael Healy (Karen’s brother) later that year. Pondering then began creating its own original work, attracting tens of thousands of views on YouTube and finding success at web and film festivals across the world. 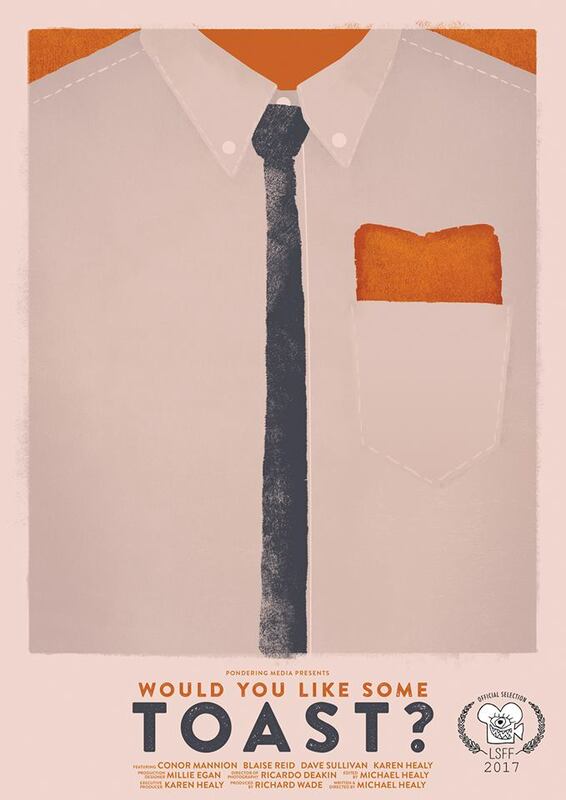 In 2015, producer Richard Wade joined the team to begin work on Pondering’s debut cinematic short, Would You Like Some Toast. The film premiered at the BAFTA-affiliated London Short Film Festival in January of 2017. In December 2016, their web series Listen to the Experts won Best Comedy Sketches at the Dublin Web Fest. Their follow-up project, Tuesday Night, was successfully crowdfunded in 2016 and will premiere at Dublin's prestigious GAZE film festival this August. With offices in Stillorgan and a growing team of industry professionals backing them up, Pondering is working to bring its brand of fresh, narrative-focused comedy to ever more ambitious projects. On every project, we develop a clear mission statement to get all producers, backers and creative leads on the same page from the outset. We take an inclusive, iterative approach to script development, taking feedback from all key parties and not settling until all concerns are resolved. We hold ourselves to management standards that are honest, professional and at all times accessible to crew and other team members. We make sure we’re always improving, undertaking detailed debriefs and post-mortems on all projects. Pondering’s focus is on a fresh, cosmopolitan comedy, with a voice that is uniquely and identifiably our own. Our first priority on every project is to refine character motivation and plot development – nothing murky or unclear. Everything needs a justification, from script elements to storyboards. If we can’t explain the decision succinctly then it’s probably not working. Karen Healy is Pondering Media’s founder, CEO and perennial lead performer. Her work on Pondering’s award-winning shorts has earned her strong press attention, including being named one of “London’s Most Creative Irish Minds” in 2015 by the Irish Post. Her credits include RTE’s IFTA-nominated Irish Pictorial Weekly, numerous roles with famed immersive theatre company Reuben Feels, and countless other adverts, shorts, and performance art pieces. Karen produced all of Pondering’s online sketches, which have reached over 20,000 views. She also performs stand-up comedy and is a passionate advocate of women in the arts. Karen is signed with Byron's Management. Michael Healy is Pondering’s main director, writer and creative lead. Michael holds an honours degree in film studies and English literature from Trinity College, Dublin and has a background in commercial writing for print and radio. He has earned a reputation for delivering fresh irreverent and cinematic comedy. His directing credits include Pondering projects Listen to the Experts, Would You Like Some Toast and Tuesday Night. Richard Wade is Pondering’s key producer, joining the team with 2016’s Would You Like Some Toast? Richard holds an honours degree in media and production management and has worked on a range of Irish-based productions, including Irish Pictorial Weekly, Vikings, and Redwater. Now a sought-after team member for productions of all sizes, Richard brings his network of industry pros and passion for ambitious, independent productions to the Pondering Team. Please feel free to contact us at Pondering Media.